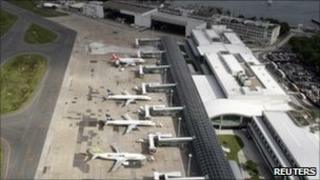 Most of Brazil's airports being improved for the World Cup in 2014 will not be ready in time, a report warns. Of 13 terminals being upgraded, 10 are unlikely to be completed by June 2014, the government-backed Institute for Applied Economic Research (Ipea) said. It warned that even if extra investment meant that the airports were ready in time, 14 of the country's 20 airports would be operating over capacity. Brazil expects between 800,000 and one million visitors during the tournament. Brazil's government promised to complete major infrastructure work as part of its bid to host the World Cup. It will also host the Olympics in 2016. In addition to 13 airports being upgraded, there is also supposed to be a new airport being built in Natal, where some of the World Cup games are due to be played. Ipea puts much of the blame on Infraero, the state-owned airport authority, which it says, "has a low level of efficiency in the execution of investment programmes". Brazilian President Dilma Rousseff has said that her government will make "a strong intervention" to ensure that the airports are ready, including opening them up to private investment.